Renatus Tuglavina who carried the mail from Hebron [Labrador] appears to be a very particular and independent sort of person for an Eskimo. Today he refused point blank to carry any mail in return, unless the contents were made known to him, and further, only if he saw fit to do so by his judgement of what it did contain. So wrote the Hudson’s Bay Company (HBC) trader at Port Burwell (Killiniq) in April 1927. Renatus was 31 years old at the time, the first son of the shaman Tuglavina and his second wife, Arnatuk. 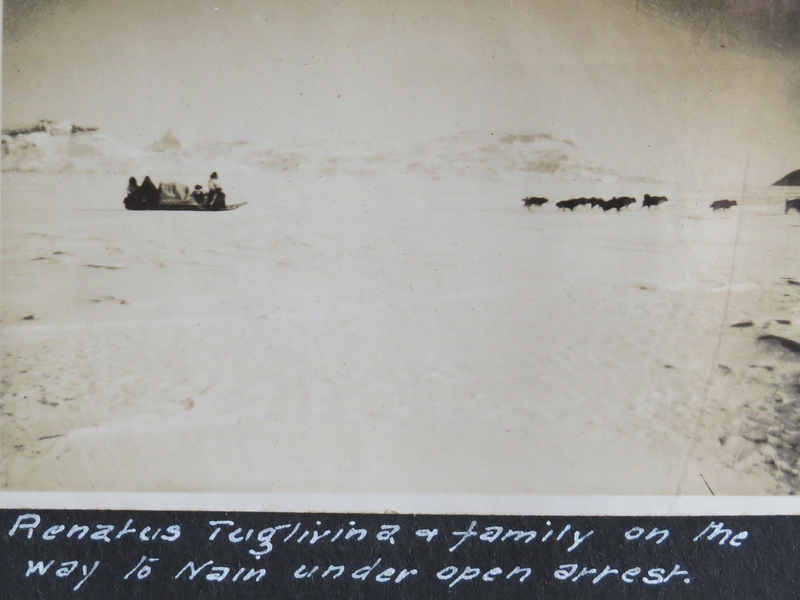 Renatus had been born and raised in Killiniq (now part of Nunavut) but had moved to Hebron in the early 1920s with his wife Loida (Kupa) Semigak, his two brothers and their families. Renatus’ given name was Kuttaktok but he took the name Renatus, which means “born again,” when he joined the Moravian church. He was a prolific hunter and many HBC journal posts in Hebron mention him packing trout, taking seals and trapping foxes. Inuit in Hebron were required to balance the Moravian goal of saving souls with the HBC’s goal of bringing in trade goods, like fox furs. Inuit were often caught in the middle between traders who refused to offer food aid or made disparaging comments about the Inuit who lived near the Mission to attend church activities rather than hunt. The worldwide depression in the 1930s led to the collapse of the cod, skin and craft markets. Inuit found themselves in the untenable situation of not being able to earn the necessary cash to purchase ammunition, which they needed to put food on the table. The sealing harvest had largely failed and only the unexpected appearance of caribou along the coast had kept them from starving. The situation became intolerable during the winter of 1933-34. Renatus, along with seven other men, decided to break into the HBC store at Hebron to get clothing and ammunition. The first time, in December 1933, they climbed through the molasses storeroom window and the next two times, both in January 1934, they used a key they had fashioned for the lock. A few weeks later, HBC officials from Nain and Nutak posts contacted a young officer in the Royal Navy, Lt. Cmdr. E.H.B. 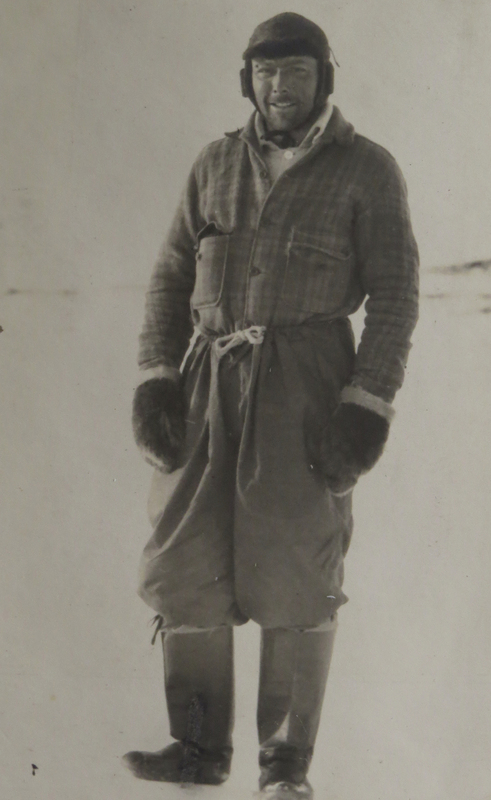 “Buck” Baker, and asked him to go up to Hebron and “quell the disturbances” by arresting Renatus, “known as being a rascal and the instigator of all the trouble up there.” Baker, who was leading a wintering-over survey party charged with updating the hydrographic charts along the Labrador coast near Nain, told the HBC men that he had survey work to do and that he had no authority to do as he was asked. He did agree to go up in a week or so to take a look around and “lend moral support to Massie.” (The Scottish trader was just 23 years old and had been with the HBC in Rigolet for four years; Hebron was his first posting with Inuit.) Baker refused to be accompanied by either HBC men or by F.M. Grubb, the Moravian missionary in Nain. It was a harrowing 240-kilometre trip from Nain to Hebron, made worse by the fact that when Baker’s camera fell off his komatik (sled), his large flask of brandy broke at the same time and cut his hand, which “bled like a stuck pig.” The surveyors had no experience making such a long trip, nevermind one over the Kiglapait Mountains. They had trouble keeping their sleds from outrunning the dogs and were, at times, up to their chests in snow fighting to right an overturned komatik. But they made it. Baker then told Renatus that he and his family would have to return to Nain. Renatus agreed to go once he learned he would not be jailed — but not until the HBC had outfitted him with more clothing and ammunition. The return trip was more enjoyable for the surveyors as the experienced Renatus led the teams, with Baker riding with Renatus’ family. Baker found housing for the family, required Renatus to hunt for his living, and put Renatus to work on the survey crew. Seven months later, in August 1934, the SS Kyle arrived in Nain and two burly policemen escorted Renatus from the survey camp to the ship, where he was to stand trial for stealing $190 worth of goods. Abram Kean, the Newfoundland sealing captain who had been morally implicated but legally cleared in the deaths of 77 men whom he had left on the ice in what has become known as the 1914 Newfoundland Sealing Disaster, was to be the judge. Baker was leaving on the same ship and spoke to Kean before the trial, arguing that Renatus should not be sent to jail as he had only been trying to cause an investigation into the injustices perpetrated by the HBC in Hebron. Baker also spoke on Renatus’ behalf during the trial. The only evidence against Renatus was his guilty plea. He did not have defence counsel. The trial was held in English with Grubb, the Moravian missionary, serving as interpreter. Kean had no time for Baker’s arguments and later wrote in his autobiography that while his sentencing of Renatus to two months of hard labour in the Twillingate gaol had met with dissatisfaction among many of the Kyle’s passengers, the “laws and constitution of the English Government are the best in the world because they approach nearest to the laws God has established in our natures.” As far as Kean was concerned, Renatus’ actions constituted a violation of heaven itself. Baker thought differently, calling the trial farcical, “Gilbertian,” and totally unorthodox. The next day he went to Newfoundland’s Commissioner of Justice, William R. Howley, to argue Renatus’ case. Howley also ignored Baker but within a short time Baker’s earlier memo to the British Admiralty requesting that the treatment of Inuit by the HBC be investigated found its way to the Secretary of State for the Dominions, which requested a reply from the Newfoundland Commission on Government. Nevertheless, within a year’s time, the Commission of Government created the Newfoundland Ranger Force to take over the distribution of relief payments, enforce hunting regulations and serve as a police force in Labrador and augment the Newfoundland Royal Constabulary when necessary. The HBC shut down its Labrador operations in 1942. Renatus lived for another 12 years after returning to Hebron. His earlier acts didn’t seem to be held against him and, according to post journals, he was well regarded by traders. His hunting and boating feats were featured in many stories by the HBC manager and writer, Len Budgell. In a telling commentary, Budgell also wrote that “it took a bit more to make me realize just how self-reliant and tough these men were … The north Labrador was not a cold, inhospitable place to them; it was home. They knew how to deal with it and it never got tough enough to beat them. The story of Renatus Tuglavina only came to light when Woody Belsheim, a radio operator who served at the secret American weather station in Hebron during the Second World War, showed me a model sealskin kayak that Renatus had made for him. Woody had kept the kayak hanging on the wall of his California home for 65 years. On the bottom of the kayak he had written in black ink: Made by Rayanastrus (sic) Tuglavina, Hebron Labrador, 1944. Sealskin. It was Renatus’ kayak that not only led to the uncovering of his life’s amazing story but also the uncovering of the secret weather station in Hebron. Renatus cut a wide swath in his 50 years on Earth, with his exploits appearing in more than five published books, numerous journals, newspapers and Moravian periodicals. Rozanne Enerson Junker is the author of Renatus’ Kayak: A Labrador Inuk, An American G.I. and a Secret World War II Weather Station, published in 2017 by Polar Horizons. 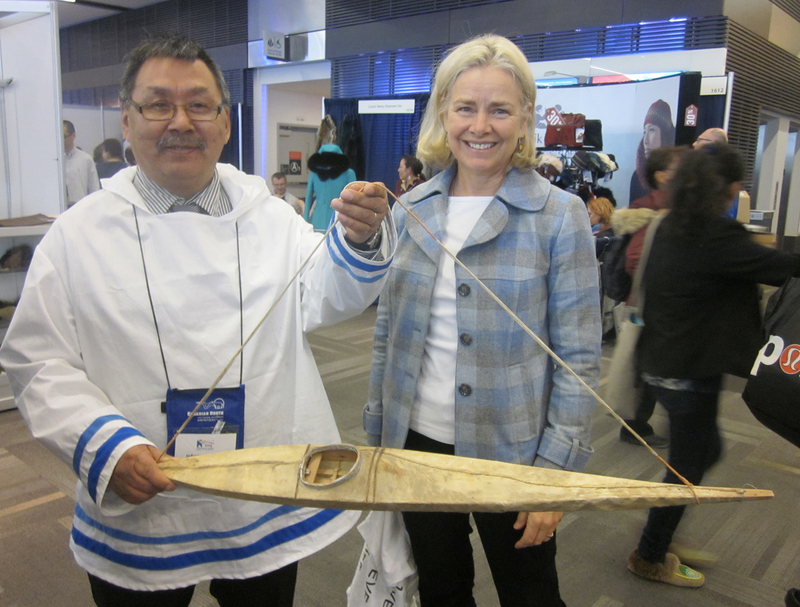 Renatus’ model sealskin kayak, along with his story, will be part of the new Illusuak Cultural Centre in Nain, Labrador.